When an unexpected power surge sparked the world's worst nuclear accident in Chernobyl, nearly a quarter of a million construction workers risked their lives to build an ad hoc "sarcophagus" of concrete around the stricken reactor. It was a stop-gap measure—and now, almost 3o years later, one of the biggest engineering projects in history is underway to protect it. 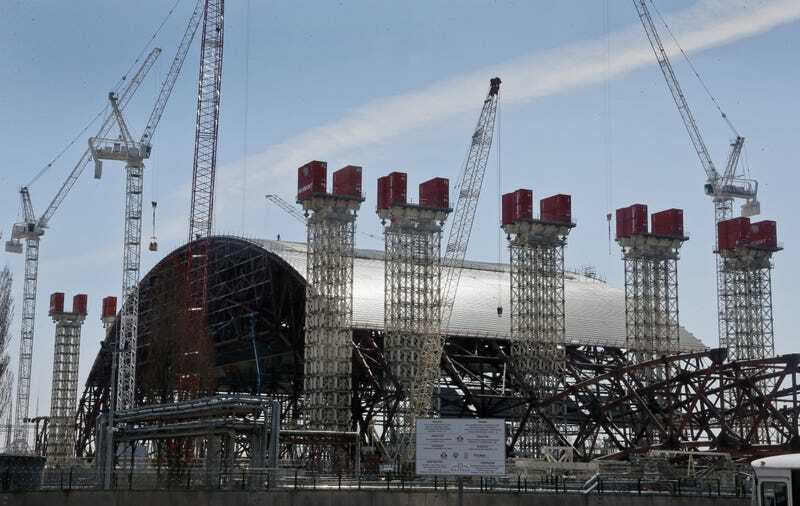 The BBC reports on the $2 billion project to protect the decaying metal sarcophagus, using an even larger metal shield called the New Safe Confinement, or NSC. In simple terms, the NSC is a massive steel archway that is designed to protect the surrounding region if the 27-year-old sarcophagus eventually collapses. The design was proposed back in 1992 by a team of British engineers, but planning has taken more than a decade—the project is now halfway complete, with a target date of 2015 for final completion. There are myriad reasons it's taken so long to get the NSC up and running, the first being the sheer scale of this 300-foot-tall protective shield. Since it will cover the existing sarcophagus, the arch is big enough to house the Statue of Liberty and wide enough to accommodate a soccer field. It's being built by thousands of workers and engineers from all over the world, each of whom has a monthly and yearly exposure limit based on where, and for how long, they work on the site. But it isn't just the scale that's extraordinary—it's the unusual way in which it must be built, since the sarcophagus is still too radioactive for sustained human presence. The crux of the plan—the reason why it was chosen in 1992—is the fact that would be built off-site and then slid over the current sarcophagus using railroad ties. The 29,000-ton structure is taking shape several thousand feet away from Reactor 4, helping to limit the radiation exposure of workers. Work has started removing sections weighing up to 55 tons each. They must be cut off with a plasma cutter by teams of two men and removed by crane—a nerve-wracking process. If a crane fails, or an operator miscalculates, and a section falls into the reactor, this too could release a new cloud of radioactive dust into the atmosphere.